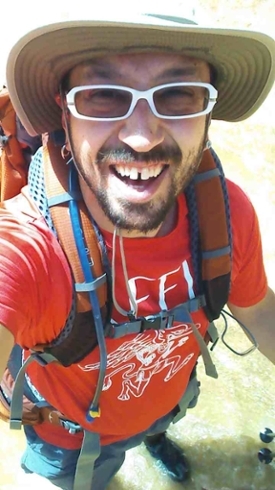 Nate Martin '16 is a President's Summer Fellow on a trip through the American Southwest with the goal of rewriting his connection to poetry by visiting areas where he first established that connection. I'm out here now in Green River, Utah on I-70 in the eastern side of the state. I've taken a day off from hiking and driving around and talking to people to sit down and figure out where I am. Rain has been following me around, and forcing me to change some of my plans. Dirt roads and slot canyons are not good places to be during thunderstorms. However, the rain eventually passed, and I was able to get into a river hike in Capitol Reef National Park called Sulphur Creek. 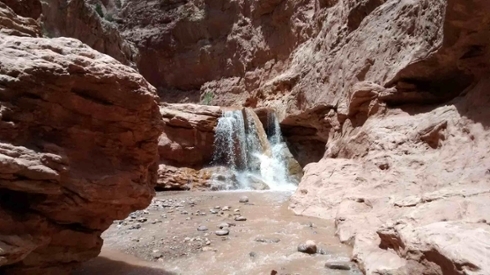 It's a beautiful and magical hike that starts in a wash that drains into a muddy and fast flowing creek. The hike is three to four miles from there along the creek and the canyon it flows through. The cliffs climbed high, hundreds of feet above me at times, and the tightest sections left me in darkness in the afternoon. It was the first hot and dry day after a spell of thunderstorms in the area, so the water was higher than usual in the creek, but trekking through it was a welcome relief from the heat. 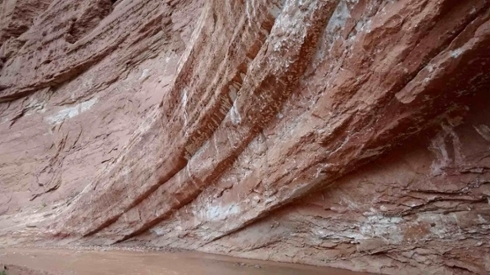 I learned about the hike from a friend that's spent decades wandering around southern Utah. He had a big smile on when he remembered it. He said that it was a water hike with a few scrambles and that I should bring rope, as I might need to lower my pack down. There ended up being three scrambles; each one was at a waterfall, and required finding a way around it. The best part about these was that they were mostly unmarked. I got to experience a little thrill at each one as I approached the roar of the falling water as the walls narrowed and the path deepened. For the first two waterfalls, the paths through were not obvious. I had to explore around and get out on some ledges to get a different perspective on the problem before I was able to see the path. Finding the way through resolved the slight thrill of danger and let me get through to the next one. The second waterfall was a little higher than the first one, about twelve feet, and a little more thrilling. With each scramble came the worry that I might not be able to make the next one, and would have to turn around and walk back out of the canyon. That would put more of a strain on my water supply (and my body) than I wanted. The further I went, the harder it was to turn back. 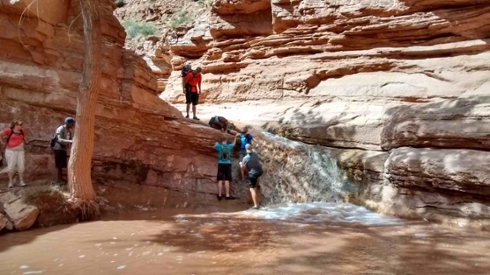 The hike ends when the canyon walls fall and the creek runs past the visitor center to the park. About four miles in, I was pretty tired from the slow river navigation and was ready for the visitor center to appear around the next curve. That's when I hit the third and final waterfall. This one wasn't as tall as the last one, but it cut deeper into the rock and had a louder roar and spray in the channel leading up to the fall. It also dropped into a very large pool of water as muddy as the rest of the creek. This presented a couple of problems. First, I had no way to gauge the depth of the pool. It could have been fifteen feet deep at its base, or three feet. I am not a strong swimmer, and have been rescued from both a river and a pool after nearly drowning. My first swimming lesson happened this last fall at school. There, I learned to swim well enough to get out of a pool, but not to enjoy being in one. My fear of deep water is better described as barely controlled terror. When I hit this waterfall, I did what I did with the first ones. I explored all around the edges to get a good view of the obstacle and to find the easiest way through it; it was just another problem. I looked down the front, but it was slick at the edge of the falls, and there wasn't much of a ledge to land on; it seemed I would just slide into the pool below, and that would be bad with my backpack on, in case it was deep. I tried climbing up and above it to my right, but found myself at the top of a thirty foot precipice with an edge of sharp rock. I climbed back down and tried climbing along the slanted wall to the left of the falls. There was a ledge a ways out from which I could jump to a shallow portion of the pool below, closer to the solid ground beyond it. I got ten feet out on that wall and spent a few frightening minutes clinging to it when I ran out of finger-holds and toe-holds. The roaring falls were directly below me, and spray would occasionally slick the slim holds I rested on. I climbed back and realized I was going to have to try going down the front of the falls somehow, no matter how much it scared me. The thrills I'd been playing with throughout the canyon were beginning to approach barely contained terror. I am afraid of swimming. I am afraid of water of unknown depths. However, before I could even try this, I needed to get my pack across. The only solid ground was too far away for me to confidently throw my pack to, so I climbed back up to the right. There was some dry land at the bottom of that thirty foot drop, and I had some thin rope with me. I tied my pack to the rope, but then realized that the rocks at the edge were too sharp; it would tear the rope apart before I could lower it. I was out of choices. I was going to have to try throwing my pack across the pool, and then slide down the waterfall after it. This process had taken about a half hour, in which I ran out of water. There was no going back. I climbed back down to the waterfall with my heart in my mouth, as scared as I've ever been. But, just as I was walking back out to the ledge, I looked up-canyon and saw four people hiking towards me: a wife and husband, and their two children. I have rarely been so truly grateful to see another human being. They were the first people I'd seen since entering the canyon several hours before. I'd even stopped a half hour for lunch, with no sign of others. I'd enjoyed the solitude until these last falls. I hiked back to meet them. “Hi,” I said when they were close enough. “The next one's really bad. I've been here a half hour, trying to figure a way through.” The woman's face fell when I said that. The water was high, and I imagined that some of the earlier traverses had been as rough for them as they had been for me. I later apologized to her for framing it that way, but I was feeling pretty desperate when I saw them. These people meant everything to me. With their help, someone could try climbing down without a pack on, and then someone else could hand the packs down. Everything became easier. Since I was pretty frazzled, and the man said he was a good swimmer, I watched while he tried climbing down without a pack. First he tried the ledge on the left, but he got stuck as well. Then he tried the face of the falls. I watched as he found the one foot-hold on the wall and was able to slowly climb down to the slick ledge below. He then walked around and checked out the depth of the pool. It was only three to four feet deep at its deepest, even in front of the falls. I felt a deep relief as all my fear drained away. From there it was easy. I handed all of our packs down, and then he helped his family descend one at a time. His wife was frightened by the climb, even with his help, and I felt better about the many frightened moments I spent up there. I went last, and was able to climb down without help. It was sketchy, but doable. I couldn't have done it with my pack on though. A problem that looked nearly unsolvable to me, alone, became fun and simple when I had people to share it with. And water of unknown depth and terror became a fun pool to splash around in before hiking through the last mile to the visitor's center. Thinking about it now, this hike had a lot in common with what I'm doing this summer. Sure, I'm moving through areas that I used to have some familiarity with, but it's been more than a decade for me since I've been out here. I'm in some unknown territory. I've also said that the main purpose of this trip is to recreate my connection to poetry, but what does that mean? How does one do that? How does one decide they're a poet, or go back to being a poet, or redefine their role as a poet? These aren't questions that I can give an answer to here because I don't have the answers. They lie somewhere out of sight. They might be in the thoughts of the next person I talk to, or they might be in the next words that I write, or they might be out in deep water somewhere, waiting for me to hold my breath and dive in.